Barlow's C.J. Brushwood came up with big finishes in back to back races to help the Bruins put away rival Gresham 96-74 in a boys swim dual Thursday. 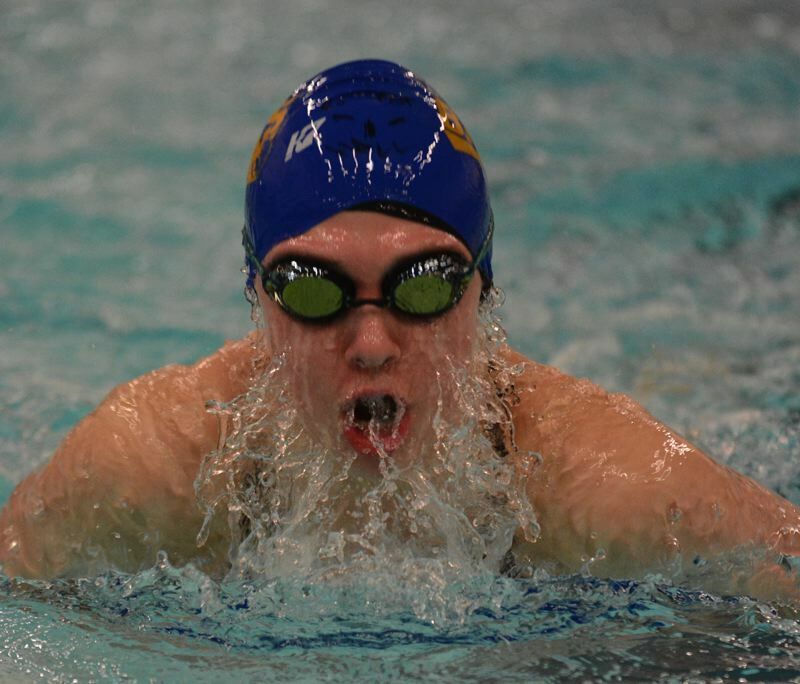 The Bruins were up 12 points heading into the late stages of the dual when Brushwood dived in for the anchor leg of the 200-yard freestyle relay and maintained a slim half-body length lead of Gresham's Mason White for the win. "I kept an eye on him and made sure I stayed in front to get those first-place points," Brushwood said. Five minutes later, Brushwood was back in the water this time for the start of the backstroke. Gresham's Riley Hogg got out to the early lead, but Brushwood made his move on the final flip turn. "I went into the wall seeing his feet and came back out seeing his head," Brushwood said. "The turns are spots where you can really make a move." Within a few strokes, Brushwood had taken over the lead spot and only expanded his lead moving toward the finishing wall. The win officially sealed Barlow's team victory, leading 81-59 with two races remaining. Barlow's Justin Logue doubled up in the distance freestyle races, while Josiah Hoccum won the 200 medley. Ben Tapasa led the Gophers with a sweep of the freestyle sprints, while Ryan Burch won the butterfly and Nathaniel Wilson won the breaststroke. • The Barlow girls won all 11 races on its way to a 121-48 dual win. Katie Simon, Kenna Quirke and Grace Doyle combined for a Bruins sweep in the butterfly. Barlow had three double winners in Madison Kernan (200 medley, breaststroke), Alexis Gover (500 free, backstroke) and Kaselyn Markell (50 and 100 free). Abigail McDevitt paced the Gophers with runner-up finishes in the freestyle sprints. 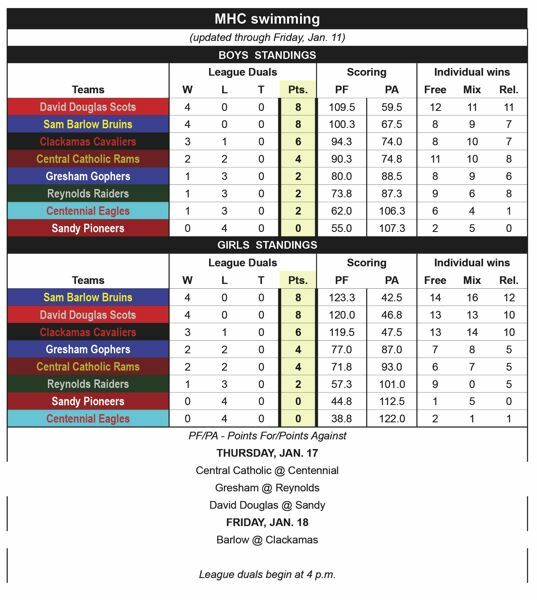 Gresham (74) — Ben Tapasa 15, Burch 13, Wilson 13, White 10, Hogg 7.5, Baisden 6, McFerran 3.5, Edwards 2.5, Floyd 2, Waldron 1. Barlow (96) — Justin Logue 15, Hoccum 13, Brushwood 12, McLaughlin 10, Urkiza 9.5, Parvakin 9, Dewey 8, Erickson 7.5, Gutierrez 5, Nelson 3.5, Fischer 2.5, Paskett 1. Gresham (48) — Abigail McDevitt 10, Schmitt 8, Lutz 7, Peetz 7, Gustafson 5, Walczyk 4, Milner 4, Garcia 3. Barlow (121) — Madison Kernan 16, Kaselyn Markell 16, Alexis Gover 16, Quirke 14, Simon 14, Doyle 11, Edmondson 9, Boos 7, Klingner 5, Dewey 5, Corbett 3, Collins 2.5, Younce 2. DAVID DOUGLAS 108, REYNOLDS 59 — Dawson Brummet and Noah Matsushima went 1-2 in the 100-yard freestyle, and teammates Brayden Franzke and Tuan Vuong accomplished the same feat in the 200 medley to keep the Scots perfect in league duals. Brummet doubled up with a win in the 50 sprint, while Franzke added a second win in the backstroke. Teammate Daniel Wong also doubled in the breaststroke and 500 free. Zach Radke led the Raiders with a win in the butterfly and a runner-up finish in the breaststroke. 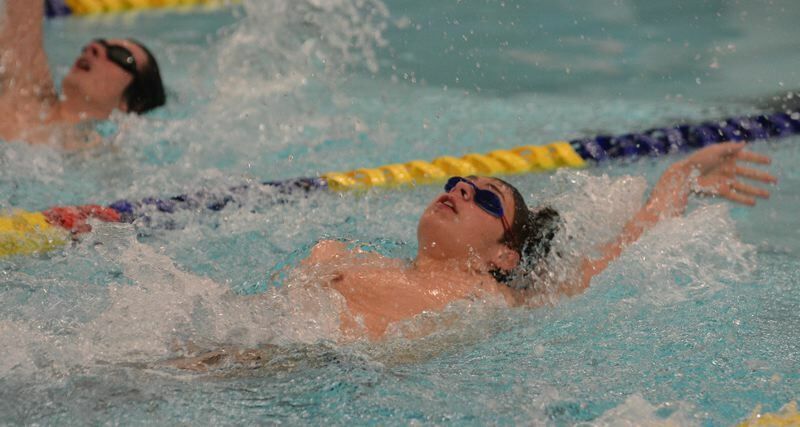 CLACKAMAS 115, CENTENNIAL 55 — The Cavs had three swimmers post double wins with Scott Visscher in the breaststroke and 50 free, Mitchell Hopper in the backstroke and 200 medley, along with Owen Ngan in the butterfly and 200 free. Devan Oliphant picked up Centennial's only win in the 500 free with a time of 5:33.86. DAVID DOUGLAS 128, REYNOLDS 38 — The Scots scored sweeps across seven events, including all five mixed-stroke races, to put up their biggest score of the season. David Douglas saw Wendy Rios double up in the distance freestyle races, while Julie Schwam took first place in the butterfly and 100 free. Both were also members of a winning relay. Jayla Dieter was first in the 50 free for Reynolds' only individual win. She also anchored the Raiders to victory in the 400 free relay. CLACKAMAS 125, CENTENNIAL 37 — Emma Gould led a Cavaliers sweep in the 200 medley and Talia Caldwell paced another 1-2-3 finish in the 50 freestyle to put Clackamas in charge 47-13 at the intermission. Amy Hua scored the only Centennial win by taking the 200 free in 2:14.20.